The British Woodworking Federation (BWF) is today (13 March) launching, in partnership with the NPTC Group of Colleges, a new qualification specifically to target the installation of fire doors in the UK. The course is designed to be a practical introduction to installing fire doors and will cover a range of topics including: the fitting of fire doors, fire door frames and linings; understanding and fitting of fire door ironmongery and seals; the inclusion of apertures and associated fire regulations related to the fitting of glass; and the effects of use on fire door performance. The qualification will be available as an optional unit for apprentices from the NPTC Group of Colleges as well as a two to three-day course and assessment option aimed at experienced tradespeople. It will enable individuals to work towards and achieve unit 358 ‘Installing fire resisting timber door assemblies and doorsets in the workplace’. Once achieved, the unit can be displayed on the reverse of the Construction Skills Certification Scheme (CSCS) card, which is used to demonstrate that individuals working on construction sites have the required training and qualifications for the type of work they carry out. The course has already been successfully piloted at NPTC Group of Colleges in Wales. “There are many critical elements to get right in the construction of fire doors, and a host of regulations governing their manufacture, installation and maintenance. But a single mistake in specification, installation or use can render a fire door ineffective. 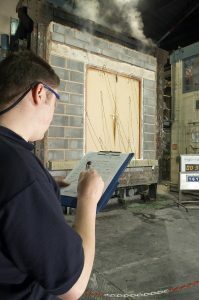 Fire doors are often the first line of defence for users of a building in the event of a fire and yet they remain a significant area of neglect – with 90% of fire doors reported as having issues within a sample of local authority and housing association Fire Risk Assessments (FRA) examined by the BWF. Subsequently, every year lives are lost or put at risk, and properties are unnecessarily damaged, because fire doors have been wrongly specified, fitted or maintained. The course was formally launched at the Senedd by Deputy Presiding Office of the National Assembly for Wales, Ann Jones and featured presentations from the BWF and Mark Dacey, Principal and Chief Executive, NPTC Group.